"The Avengers" isn't the only major team-up taking place this week. Austin-based Alamo Drafthouse's poster-art boutique Mondo has joined forces with Martin Scorsese's film preservation organization The Film Foundation to create new 35mm prints of eight essential films with brand-new posters to go along with them. The plan calls for new 35mm prints of "King Kong," "The Night of the Hunter," "The Old Dark House," "Paths of Glory," "Rashomon," "The Unholy Three," "Film" and "Shadow of a Doubt." Tickets have already gone on sale. Scorsese's Film Foundation has arguably played a more essential role in the preservation of film history than any other institution (its mandate to keep an awareness of the medium's fragility and wonder alive extended into the plot of last year's Scorsese-directed "Hugo"). However, the other participants in this collaboration have also been instrumental in the continuing vitality of film culture. The Drafthouse, which most recently announced plans to bring its famous in-theater dining experience to New York with a theater set to open later this year, has been a major player in the national conversation to preserve the sacred quality of the moviegoing experience. Mondo applies a similar logic to movie posters, creating limited runs for modern blockbusters, classic films and cult hits alike. The three new Mondo posters previewed in the following pages demonstrate an attentiveness to artwork that takes the focus off simply telling you the content of the movies -- the movies take care of that – and instead emphasize the distinctive environments, themes and emotions that make them into timeless cultural objects. By capturing the movies' essence, the posters transcend their marketing value to become eloquent artworks in their own right. While "The Killing" put Stanley Kubrick on the map as a director to watch, his 1957 "Paths of Glory" marked his first large-scale effort, a powerful war-in-the-trenches WWI epic starring Kirk Douglas as morally conflicted officer of French soldiers unwilling to lead his men into certain death. Mondo's poster, designed by Jay Shaw, conveys the movie's radical disdain for the way battlefield tactics disregard the value of human life. 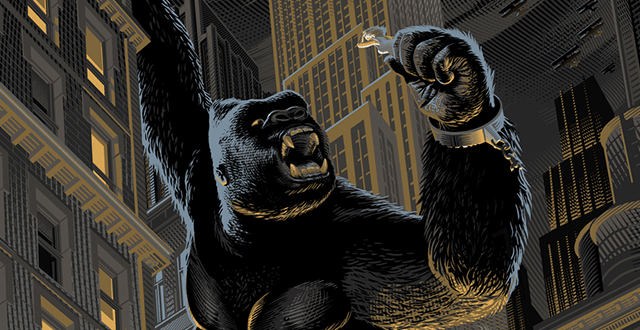 The original blockbuster, "King Kong" has become such an iconic monster movie that the sheer scope of its vision has been nearly eclipsed by its fame. Mondo's poster, with its deep yellows juxtaposed against an exaggerated art-deco cityscape, resurrects the movie's underlying appeal. Notably, we don't see the top of the skyscrapers, a decision by artist Laurent Durieux that makes the giant ape look relatively small in the grand scheme, trapped by his surroundings rather than attacking them. It was beauty that killed the beast and the magic of "King Kong" is that we feel sorry for him. "Vertigo" had more nuanced storytelling and "Psycho" burrowed deeper into its main character's psychological disarray, but many still regard 1943's "Shadow of a Doubt" as the seminal Alfred Hitchcock film. The movie follows a murderer on the lam (Joseph Cotten) visiting his relatives in Santa Rosa, Calif. and forming a strange bond with his rebellious niece (Teresa Wright). As she grows increasingly suspicious of her uncle's motives, the young woman must reconcile her personal allegiances with a higher sense of moral responsibility, a struggle marvelously rendered by Mondo artist Alan Hynes in this bleakly expressionistic poster.